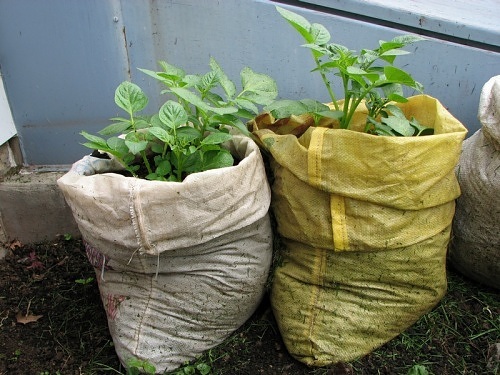 This is definitely the way forward regarding growing spuds in a small space and an excellent way to get beautiful new potatoes often earlier than any grown in the garden as bags of pots can be put in the greenhouse or somewhere sheltered. Lots of places sell containers especially for growing potatoes but anything that is deep enough should be fine. 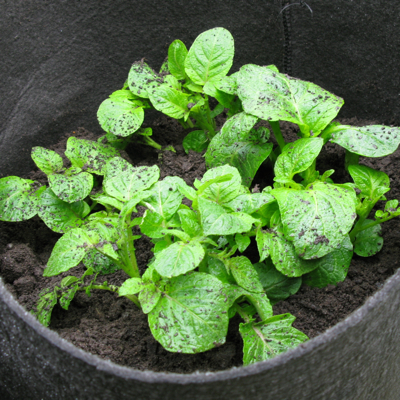 Use an old compost bag or dustbin - the spuds need space to form a good crop, small pots don't give the same yield, but can be grown in black poly pots that are about 8 inches in diameter or a huge, deep flower pot. It doesn't sound very big but you can get a nice crop in it from one tuber. If using compost bags or growbags, cut off one end and empty the contents into an old dustbin to be reused. Roll over the top of the bag, it also looks better if you turn the bag inside out first so you have the black side showing rather than the side with the writing on. Make sure there are enough drainage holes then un-roll the bag as you fill it with compost. This gives you potatoes the whole length of the growbag standing up longways. You can pick up large plastic pots quite cheaply these days and they might give better protection than a bag? Make sure you wash them out really well though, using Jeyes Fluid for this purpose, you don't need much at a time, so it'll last along time and is really worth doing. You will need some drainage holes in the bottom of the bin, and when you harvest just tip the dustbin over. As for the potatoes themselves, better get good quality seed potatoes, while potatoes from the supermarket or saved from last years crop can be used, theses may have been sprayed with goodness knows what or have traces of disease or blight which you could then be transferring to your soil for years and years to come. It's really not worth the risk. Put them to chit about three weeks before you plan to sow them. 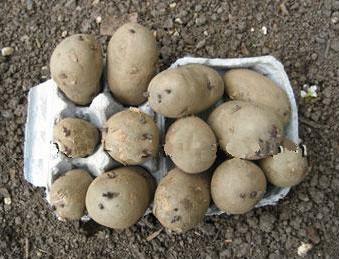 If you need to store them before chitting keep the potatoes in the dark, in whichever way suits you. Cardboard box/wrapped in clean rags/pillowcase/envelopes just not plastic, as this will cause them to sweat. To chit the spuds - put them to stand in an egg box bottom or scrunch up some newspaper and put it in a tray in a light, cool place but not in direct sunlight. You need to put them "rose" end upwards (that's the end with the most eyes) for best results. Look at them every week and when you see them sprout little shoots wait until they are about half an inch long before planting. Always check every week as you don’t want the sprouts to get too long. Only leave two or three sprouts on each tuber and if they are big ones cut them in half for double the seeds. harvesting 10-12 weeks from planting. Second earlies - plant from the middle of March to late May and will be ready for harvesting around 13-14 weeks from planting. Early maincrop - plant from the end of March to late May and will be ready for harvesting around 15-18 weeks from planting. Late maincrop - plant from the end of March to late May and will be ready for harvesting around 20 weeks plus from planting. These ready times will vary depending on where you live - a week or two earlier on south coast. Wait until the soil has warmed up a bit or you will just set them back. You can start them in the greenhouse or a sheltered spot for earlier crops. Fill the bag about a third full with a mixture of soil and compost and plant the potato tubers Depending on the size of the pot or bag, put 1 to 3 tubers in each one. They will form side shoots and spread out, so no need to put in too many - remember that they are in a container and do not have the reserves of water found when planted in the soil - so you will need to keep a check on the moisture content of the container. Stand in the sun and water every few days if the compost feels dry as potatoes dislike being either very wet or very dry. You find this out by sticking your fingers in, you'll soon get to know. 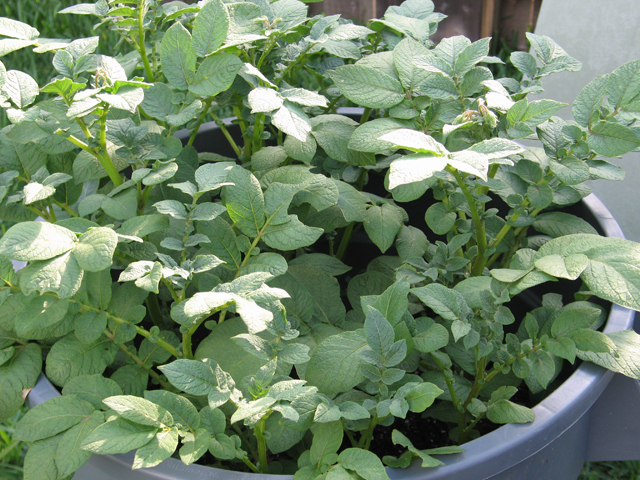 As they grow "earth up” the plants, as when potatoes form they come to the top of the soil if you cover with soil then the potatoes are not exposed to the light and won't turn green. Do this when they are about 8" high, put more soil/compost on top so that the stems have only about 4" showing. Do this until the compost gets to the top. This also protects the stems from frost and encourages them to produce more roots and spuds. Carry on earthing them up until you've filled the bag. Usually there are potatoes to be picked once the plants produce flowers but you can leave the potatoes to grow bigger. Keep well watered and don't allow them to dry out. To find out if you have spuds ready for picking, gently delve your hand into the compost towards the bottom of the bag. Harvesting is easy, tip the bucket out and collect all your potatoes. The compost can be re-used elsewhere around the garden or added to the compost bin/heap. Store them in paper sacks or large paper bags once harvested, somewhere cool and in the dark or they'll go green. But if you can, leave them in the soil until you need them.